Ladies and gentlemen, the final part of Trial of a Time Lord, the last Colin Baker story, the verdict delivered (in more ways then one), and the revelation of The Ultimate Foe. Oh, it’s the last part of a story with a big-time reveal, so SPOILER CAPS ON! The final part of The Trial of a Time Lord is called The Ultimate Foe. The Trial finally becomes an active piece of the story, instead of just a bookend. The Valeyard finally becomes an active villain, instead of just sitting there being snarky. But it all seems like a case of too little, too late. The action and conflict we’ve been waiting for is restrained to the final two episodes of a fourteen-part story, with a second part that had to be rewritten in a weekend by two of Doctor Who’s weaker writers, replacing its greatest. With most of this series, I’ve had to say this, but it remains true: it’s all a bit of a shame, really. 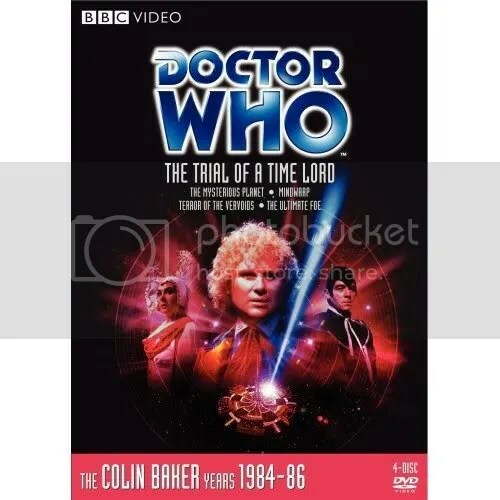 Colin Baker’s Sixth Doctor gets one last chance to shine in the glow of a television set this serial, and he gets to quote some poetry and be heroic and solve a proper mystery and fight a proper villain. It feels like a weird, certainly unintentional summation of Baker’s run as the Doctor, stuck in a scripting nightmare, with producer-added companions and an appearance by the Master for some reason. Peri even shows up. There are a lot of brilliant moments for Baker here, namely in his reaction and subsequent self-call to action when he’s told the Valeyard’s true identity. He gets to outthink the villain and make mistakes and be generally quite heroic. He even gets to yell at his own people, something other Doctors never got the chance to. Surprisingly, the only survivor of the lead cast into the next season, Bonnie Langford’s Mel Bush, isn’t really a huge part of this story. Mel spends all of her time in this story with the Inquisitor in the Trial room. She doesn’t even get to give her testimony in the Doctor’s favor, the supposed reason for her arrival on the station. She does make an attempt to go into the Matrix after the Doctor, though she is at first foiled by an old man tripping her. It takes her until the second half of the last episode to actually do something about it, meaning that, in my eyes at least, Sabalom Glitz takes a larger companion role than the actual companion in this story. I’d argue that Tony Selby’s Sabalom Glitz takes on a pretty heavy companion role, following the Doctor through the Matrix and all. He’s downright likable in this story, and the idea that he’s done business with the Master before (unseen in the show) is one of those “other adventures happening that we don’t see” hints that Trial did better than most of the other attempts done in Doctor Who. I think I liked Glitz more in his relatively small appearance in this story than I did in all of the The Mysterious Planet. I really do understand why they brought him back so many times now. Here’s hoping it’s an upward curve when/if I review Dragonfire. Not gonna lie here, the man has absolutely champion sideburns too. It’s a last hurrah and a big reveal for Michael Jayston’s Valeyard in this last part of the Trial. He actually gets to be a proper villain too, laying traps and laughing diabolically and being a general nuisance for our Doctor. He even gets rid of his rubbish hat! I, personally, love the reveal that the Valeyard is an evil distillation of the Doctors’ dark side, I just wish that there had been a better commitment to it. He’s a nebulous bit of evil, not properly a future Doctor, which is too much of a walkback for me. I’d have loved for the Master to just stick to a number in the reveal, though the “between the twelfth and final” bit of the line makes a great loophole to the conceit that there can be only thirteen Doctors. Jayston absolutely lights up the screen in this two-parter too, showing that he has massive Doctor Who villain chops. I’d have loved to see him come back at some point, but I can understand that the continuity nightmare his character represents scared some writers away from it. I have no idea why Anthony Ainley’s Master needed to be in this story, if I’m honest. He’s convenient to the plot and gets to make his annual appearance, but that’s about all, really. We don’t need another villain, in fact the Master spends a majority of his time helping the Doctor in his own devious way. It’s just seems a bit muddled, though any excuse to break out the “diabolical” black-wash TARDIS interior the Master has is good enough for me, really. I also like the idea that the Master wants to eliminate the competition villain-wise in his game against the Doctor. It helps to show that this guy is less of a proper enemy and more just genuinely crazy, long before that was made into a fact in the new series. He wants to toy with the Doctor, mess with him, but I doubt he’d kill the Doctor if given a real chance as it would spoil his fun, and Ainley is great at playing that. As a whole, the Trial of a Time Lord, like any single Doctor Who serial, has its ups and downs. There are good stories and bad stories, and good elements and bad elements from each story, right down to the individual parts. The Ultimate Foe shines as one of the good stories. It’s engaging, it’s tight and vaguely surreal, and there’s a great villain to fight the Doctor. It really amps up the performances all around. That said, it’s still saddled with being part of a less than impressive whole, and honestly is just the best of a bad season. It’s a great breath of air, but the air is hardly fresh. Again, you’ve made it this far. Finish it. This is the bit where all of the big reveals and action happen, so it’s a fun, proper Doctor Who adventure. I give it three nebulous distillations of evil out of five. This entry was posted in Doctor Who Review and tagged bbc, doctor who, eighties, mel, sixth doctor, television, the master, trial of a time lord, uk, valeyard. Bookmark the permalink.